On 17 January, I (Matej Grek) went to Malenovice near Lysa hora in the Beskydy mountains to "hunt" halos in diamond dust, because humidity was near 98% and temperature below zero. However, as the temperature was still not low enough, they stopped operating the snow guns, so I went back to the train stop, and on the way, I noticed Altocumulus Virga clouds. They started to disintegrate into ice crystals ... so this was the chance to see my first ellipse ever. I looked through sunglasses and there was something that looked like a sun pillar. 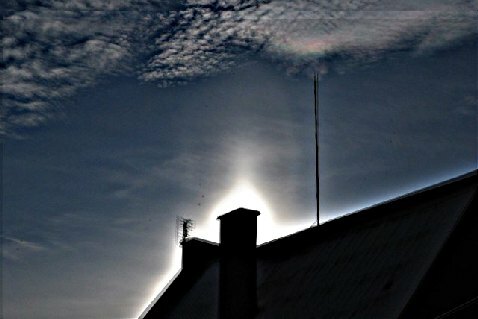 I blocked the sun with a chimney and started taking photos. In the train I looked at them, and noticed an elliptical shape. Back at home, I stacked the images, and Marko Riikonen also helped me by creating an animation ( 1 ). It has proved to be clearly an elliptical halo - my first one. I often have problems with distinuishing optimal conditions for observing elliptical halos. Any advices? That is a nice catch I got an elliptical halo display last year that lasted over two hours and had up to three rings and did time lapse and observed how the ellipse would shrink. The halos in that display were bright, sharp and colorful at times. Jakub as far as conditions go look for AC clouds that are dissapating into ice crystals. Jakub: Michael is very right. You really have to look for Ac virga clouds which are often seen also with iridescence which you can see at images of mine. Also You should cover the sun with something sharp like chimney or street lamp or something like that ;). Michael: Is your time-lapse of that ellips somewhere on the internet ??? Because it sounds very tasty... ellips time-lapse :). Its not online yet but if I can help to turn the still frames into a movie I will do that. I was amazed with the way the halo would shrink as the crystal cloud layer would move. It did this three times and it always started when a piece of AC cloud would preciptate as it would move in front of the sun and then halo fragements would coaless into a large elliptical halo with two or more ellipses then it would shrink. When the vid is made I will go to youtube and upload it and then post a link.